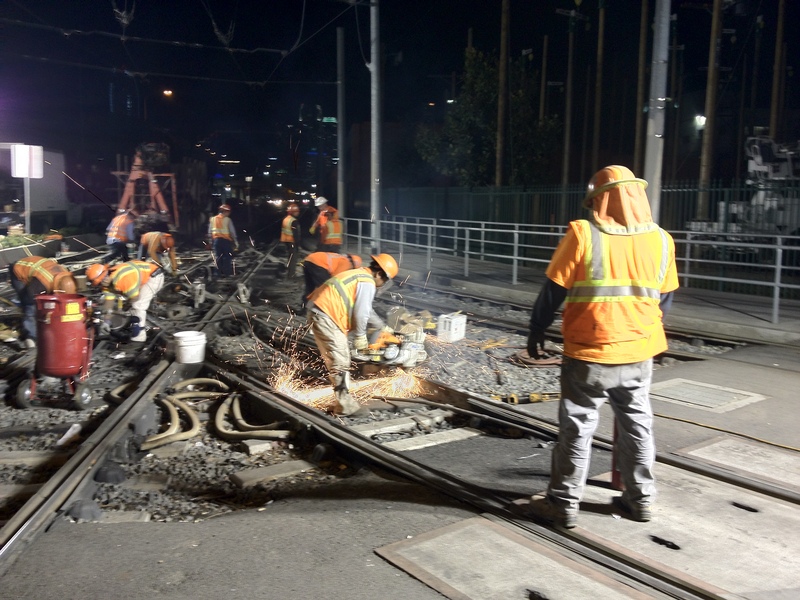 Here are a pair of photos of work on the Blue Line-Expo Line junction on Saturday night. In the first photo, crews cutting a section of the rail to realign and in the second photo crews are working to secure newly aligned rails with heat activated epoxy. Work is going well — test trains are expected to run over the junction late this afternoon. The work is the reason that the Blue Line is not running this weekend between 7th/Metro Center and the Grand station and the Expo Line is not running between 7th/Metro Center and the 23rd Street station. Bus shuttles are replacing trains on both lines. For more about the work being performed, here’s a Source post from Friday. The service alert for the Blue and Expo lines is after the jump. 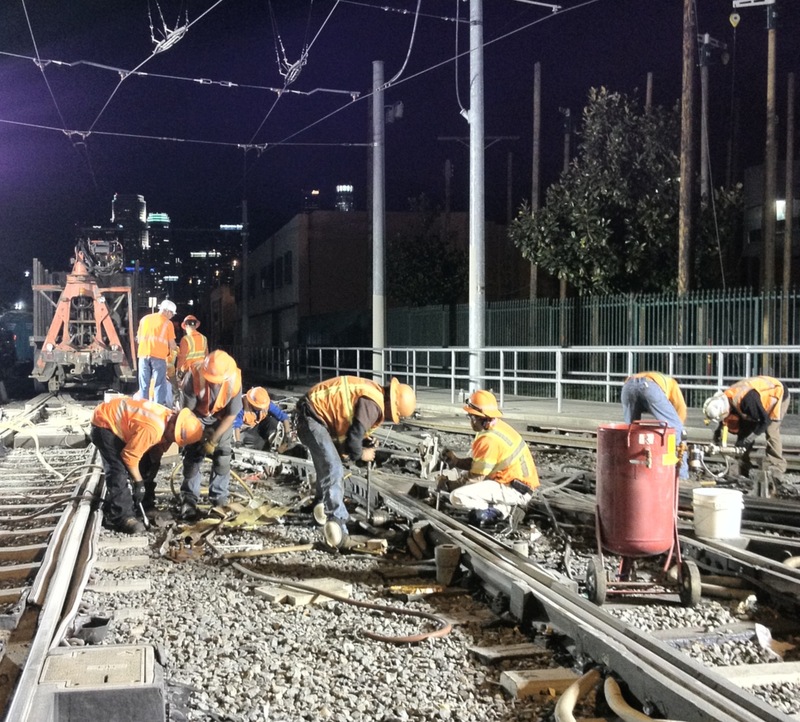 Due to railway track work in Downtown Los Angeles, Metro Blue Line and Expo Line train service will be impacted the weekend of February 15-17, 2013. Metro Blue Line: No train service between 7th/Metro Center and Grand Station. Metro Expo Line: No train service between 7th/Metro Center and 23rd Street Station. Patrons will be provided with replacement shuttle bus service during this time. Shuttle buses will travel to and from all impacted stations: 7th/Metro Center, Pico, Grand and 23rd Street Stations. Metro will provide signage directing transit riders to nearby on-street shuttle bus locations. Metro personnel will also be available at stations to assist patrons. Service alert information is now on display on station electronic message boards. Metro apologizes for any inconvenience this service impact has to its transit customers.